I’ve seen many sites and youtubers that claim to be able to give you unlimited Battle Points or Diamonds. These claims are all fake, as they will lead you to sites that ask you for your account info, and maybe even try to steal your password. These sites will also send many advertisements and popups, including some that will trick you into buying things you don’t want, installing apps you don’t want, agreeing to terms and all that stuff. 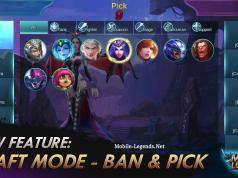 You fill in your Username, device platform and the amount of diamonds you want. 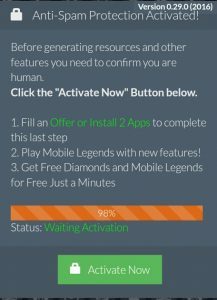 The site will act like it’s loading and processing a lot when it’s “generating your Diamonds”. In this case, the site needs you to “activate” the process with a “human verfication”. This is not a human verification! 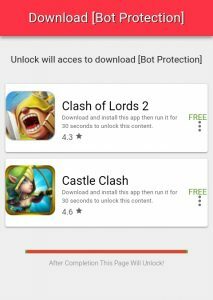 It’s just an advertisement that wants you to install 2 apps. 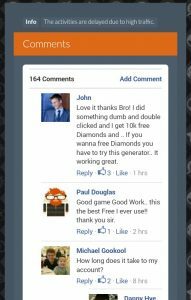 The site will say that after you dowload and play these games for a while, your Diamonds and Battle Points will be added. But in fact, this site doesn’t even know if you played these games and how long. It doesn’t have access to that information. The only reason why people make these sites, is because they get money by placing those ads on their page. But it doesn’t look like it’s fake! a fake comment section/chat: as you can see here, there’s often a comment section or small chat with some comments in it. They’re always positive, to make people think it’s actually working. But it’s just a recreation. If this picture had better quality, you could see that the ‘like button’ is photoshopped. 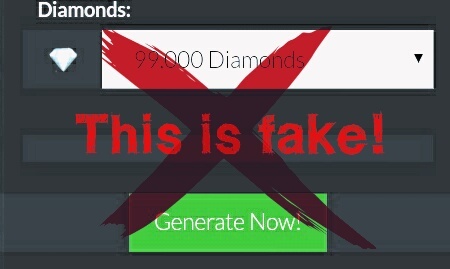 process bars: as mentioned before, when the site is “generating your Diamonds”, you will see a process bar with a lot of words that make it look more realistic. But of course, it’s not. limited time: many sites show you a timer that indicates how much time you have left to do all the actions. They do that to make sure you do it immediately, and not plan to do it the next day, and then forget about it. They want you to keep going and install the advertised apps! One more reason why it’s fake. I’m not a master programmer or something, but i am capable of using some basic knowledge and logic sense to conclude that adding Diamonds and Battle Points isn’t easy, or even impossible. At least in this game. 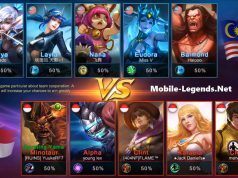 And even IF it was possible, programmers won’t spend days or weeks to hack a simple mobile game, which is not even pay to win. The only reason why they would do that, is because they want to make money, and that’s way easier by creating a fake site that’s just showing you advertisements. 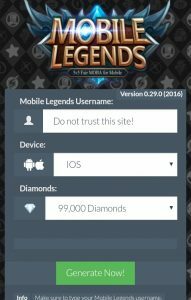 Don’t trust these sites that promise you unlimited Diamonds or Battle Points. They only want you to see the advertisements! I think i have less to say about this topic. I’ve also seen some some videos that show you how to install cheats. Some are probably fake, some may work. The fake ones will probably look the same as the fake hack above. But either way, cheating makes this game unfair, and to be honest – games are just for fun, and do you really have more fun when you’re cheating? I doubt that! Play safe, play fair and have fun! I live in Belgium (Flanders), i played this game for about 2 months and i really love it! I'm not a native English speaker, but I think I'm fine at it. Thanks for posting this! Even if it were real, let’s stick to playing this game we love legitimately and supporting it properly so it keeps getting better!